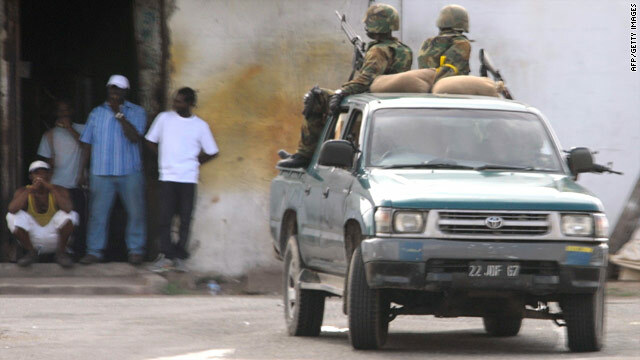 Members of the Jamaica Defense Force patrol a section of western Kingston on May 24. (CNN) -- West Indies cricket officials have moved two international matches from Jamaica due to the outbreak of violence on the Caribbean island. The final one-day international of the series against South Africa has been switched to Trinidad along with the first of three five-day Tests against the tourists, as a state of emergency is in effect in the Jamaican capital of Kingston. More than 500 people have been arrested, the Jamaican government said on Tuesday, with at least 44 dead according to reports following violence after a failed attempt to arrest a suspected drug kingpin. Cricket South Africa chief executive Gerald Majola backed the move by the West Indies board. "CSA is monitoring the situation closely there with the West Indies Cricket Board, the International Cricket Council and the South African Government," he told the Cricket South Africa Web site. "The Proteas' safety is our first priority and we thank that WICB for their swift action. Kingston's Sabina Park had been due to host the fifth one-day match on June 3, as well as a warm-up game on June 6-7 and the opening Test from June 10. The two internationals will now be held at Port of Spain's Queen's Park Oval, while the venue for the practice game has yet to be confirmed. South Africa won both Twenty20 matches, which followed the world tournament for cricket's shortest format, and have a 2-0 lead in the ODI series going into the matches in Dominica on Friday and Sunday. The second Test will be held in St Kitts from June 18 and the final match is in Barbados from June 26. Meanwhile, England reached 362-4 on the opening day of the first Test against Bangladesh in London on Thursday. Jonathan Trott top-scored with an unbeaten 175, the highest of his two centuries in the five-day format, as he added 181 runs for the second wicket with captain Andrew Strauss at Lord's. Opener Strauss made 83 on his return to the team, having missed England's World Twenty20 triumph in the West Indies. Kevin Pietersen (18) and Ian Bell (17) failed to capitalize on solid starts, but Eoin Morgan then helped Trott add another 104 as the former Ireland international ended the day unbeaten on 40 from 69 balls. South Africa-born Trott faced 270 deliveries, hitting 17 boundaries.